Our 1-day Customer Service training course will give your team versatile, customer care skills to enable them to deliver excellence in any client-facing role. Our training style focuses on building confidence through practical learning. This is an interactive workshop, covering a wide range of customer care skills including communication, understanding customers, building loyalty and handling difficult situations professionally. We offer this course exclusively for in-company bookings. Delivering customer service as a programme tailored to your customer service team will ensure that we can focus on challenges and goals relevant to your business. 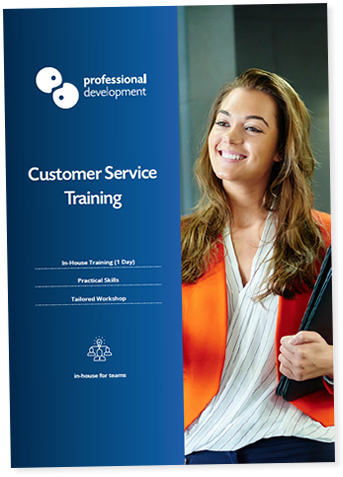 What are The Benefits of this Customer Service Training Course? During this course, we teach the definition and importance of consistently providing Customer Service Excellence. Through a blend of practical and theoretical learning, we will help you to develop your confidence in dealing with any customer care situation successfully. Challenging situations in Customer Service are inevitable. Our Customer Service training covers techniques for handling these situations with ease. Our Customer Service Courses are designed to give you a skill set that benefits your everyday work. At the end of each workshop, you will have techniques that you can put into action immediately. What is covered on this Customer Service Training Course? Is this Customer Service Training Course Right for Your Team? If you are considering this course for your team, it's worth taking a look at the points below. They may help you assess whether it's the right fit for you. This course is for anyone who interacts with customers either by phone, email or face to face. Core customer service skills are the same in every sector. Therefore, the versatile skills we teach during this course are suitable for participants from every industry. It's important for managers to understand the challenges faced by their team. Understanding and possessing essential customer service skills will help any manager improve their team's performance. If you're still unsure, we'll be happy to advise you on the best solution for you and your team. You can contact us by phone on Freephone 1800 910 810, or click below to ask us a question about customer service training.